US-UK Crochet Terms Conversion Chart! In preparing for the blog’s debut, I’ve been working on a simple pattern easy and fun enough for knitters of any skill level: the Braided Infinity Scarf! 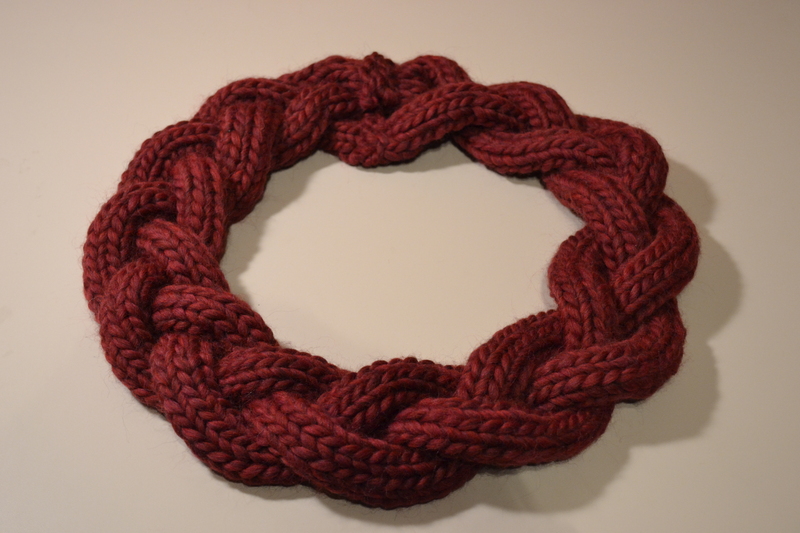 This scarf is so fun and easy enough that you can whip it up in a couple of hours. 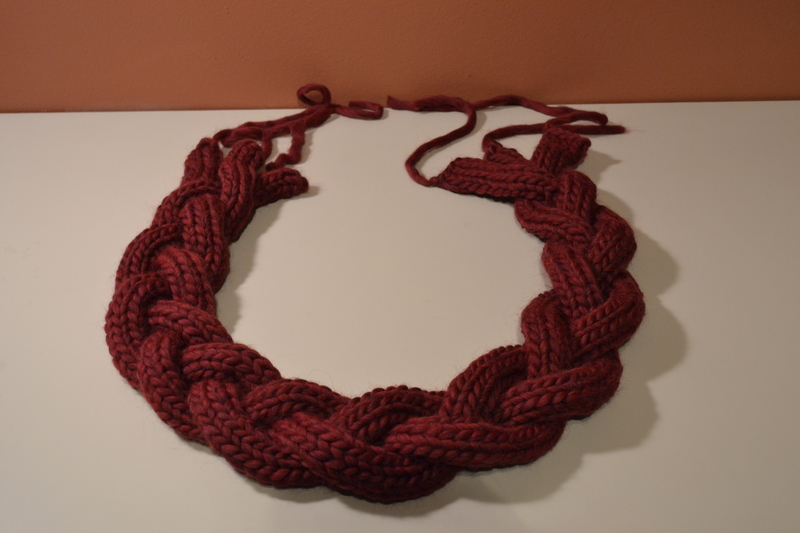 Make it in one solid color or in three strands of different colors–however you make it, it will look lovely and keep you cozy! This pattern ranks as Easy on our difficulty chart. The yarn I chose for this scarf is nice and bulky, which is why I used the larger needles, but you can make it out of any weight of yarn and needle size you prefer, so long as you adjust for length and thickness of each of the braided strands! Gauge isn’t really important, as long as all of your strands are the same length and wrap comfortably around your neck–make sure you make them slightly longer as they will shrink up in size when you braid them! Also, this scarf is worked in the stockinette stitch, which means that unless you block your work, it will curl up along the sides. I did not block my work because I liked the way the ends rolled in together, and I just made sure to braid them together with the rolled edges together in the back. This made it more like thick cords or tubes, a look that I preferred. 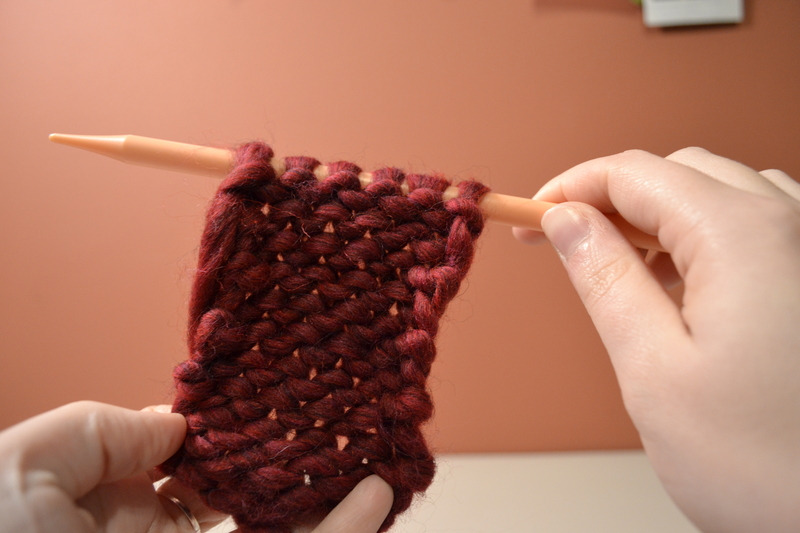 Row 1: Knit each stitch across the row (6 stitches, or however many you need for desired scarf thickness). Below is a photo of what the front of the work looks like: ten rows of the stockinette stitch with the knit-side facing. Row 2: Purl each stitch across the row (6 stitches, or however many you need for desired scarf thickness). Below is a photo of what the back of the work looks like: ten rows of the stockinette stitch with the purl-side facing. Rows 3-140: Repeat rows 1 & 2, knitting one row and purling the next. As you work, the purl-side will curl inwards, turning the strand of scarf into a sort of cord, which works well when braiding later. Tip: I placed all of my strands right-side (knit-side) up on a flat surface and rested something heavy on them to keep them steady while I braided them. A large book or even a laptop will do the trick! When braiding, make sure that you don’t twist the strands; you want to have the open (“curled”) part of each strand in the back so that the front side shows when you wear it. Once you’ve braided your strands, just weave in your ends! 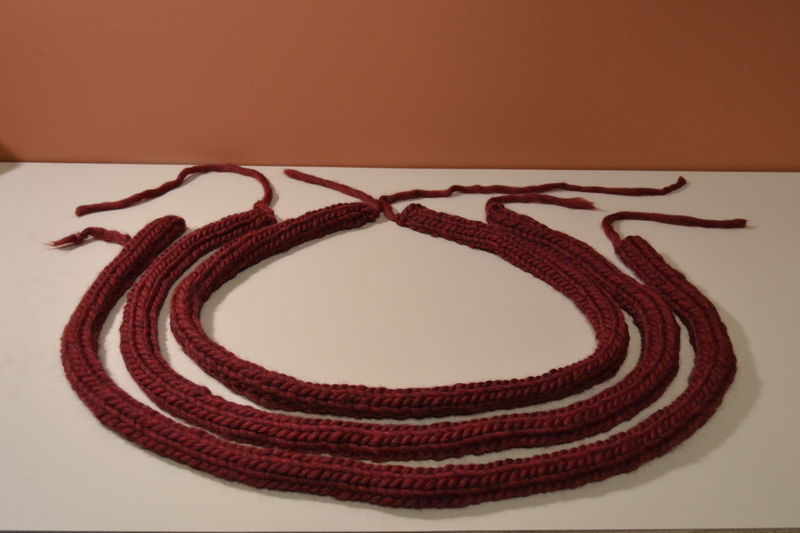 There are a bunch of ways you can do this, but I took the tail ends of each strand and used them to weave together the two closest ends of the strands on either side of the scarf (top, middle, bottom). Then weave in whatever tails you have left, trim them, and there you go! I confess, this is only the second item I have ever knitted, so I know other beginner knitters can do this one! It works up fast with the bulky yarn and larger needles, and it’s so nice and encouraging for a beginner to have a finished product quickly! If you give this a try and feel like sharing, post a picture in your comment! I would love to see all the different ways this fun scarf can be made! Like it? Print it! Pin it! Share it! Hello there! I’m Alex, and I’m so pumped that you’re here! Take a few minutes to browse the site. Why not check out these great resources while you’re at it? If you have any questions, please contact me. I’m so excited to craft with you!